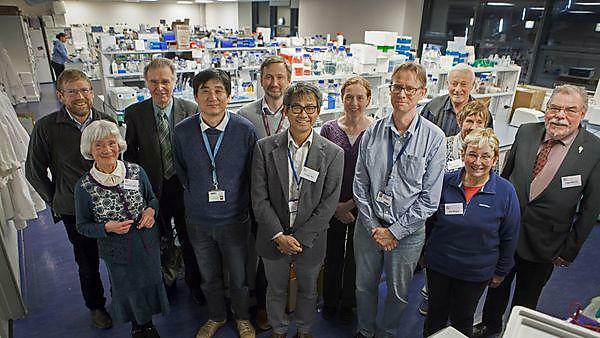 A group of people either diagnosed with Parkinson’s disease, or who care for someone with the condition, have visited the laboratories at Plymouth University Peninsula Schools of Medicine and Dentistry to see for themselves the ground breaking work being carried out there to develop therapies and treatments where there are currently none, and to meet the researchers and scientists involved. The group was made up of people who were either already involved in clinical trials or who had seen recent publicity about advances being made in Parkinson’s research at Plymouth University and who had contacted lead researcher, Dr. Kim Tieu to find out more. They were also given the opportunity to learn more about the new £14.8 million Derriford Research Facility which will be located adjacent to the existing laboratories and Derriford Hospital. The combined laboratories will house biomedical research teams, bringing all of Plymouth University’s lab-based health research on to one site and facilitating further collaborations with clinical researchers at the hospital. The visitors were given a tour of the research facilities by lead researchers Dr. Kim Tieu and Dr. Oleg Anichtchik, who then gave a talk about their work together with Parkinson’s consultant neurologist Dr. Camille Carroll. As well as Kim’s study, other research on show included another mitochondria-based study led by Kim and Oleg, and a range of clinical trials investigating the effectiveness of not just drugs, but also technology. Camille Carroll leads a clinical trial to assess a new technology for detecting Parkinson’s disease at an early stage. Called the Body Sensor Network (BSN), it is a system comprised of various body sensors worn on the arms and torso, accompanied by a microphone to record speech patterns. The aim of Camille’s study is to assess the degree of accuracy with which the BSN can distinguish people with early Parkinson’s (diagnosed within the last five years) from those unaffected by the disease, and from those with other neurological conditions such as Alzheimer’s disease. Plymouth University is fundraising for medical equipment for the new Derriford Research Facility. If you would like more information about research into Parkinson’s disease, would like a laboratory tour or to make a donation towards the equipment, contact Paola Simoneschi, Development Manager, Medical and Health.